All available seven days a week! 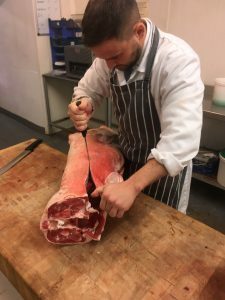 Our butchers counter has been growing from strength to strength since its opening in 2010 and has enabled us to offer our own home reared lamb and beef which leaves the farm only for slaughter. We also offer a full range of freshly butchered local meat seven days a week. 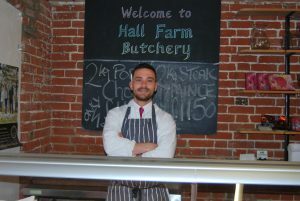 Hall Farm beef and lamb is born and reared on the farm, grazing on the meadows surrounding the shop and restaurant overlooking the Dedham vale. Our cattle are a continental cross breed and our beef id hung for a minimum of 28 days to ensure a tender full flavoured finished product. Our Lambs are reared on grass, ewes milk and home produced cereals. our two rams are a pure breed Texel and another pure breed Zwartble, whilst our ewes are Texel cross as well as Herdwick. Our Award winning sausages are all made in house using nearly 100% pork shoulder and very little rusk! 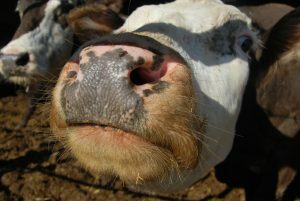 we use prime cuts of beef for our Homemade burgers which are absolutely fantastic on the BBQ. Our team of dedicated butchers Are always keen to meet any specific requirements you may have from certain sized joins to less common cuts or an extra thick piece of rib eye steak! Like all good butchter’s shops we offer a professional service from an experienced team meaning you will go away with exactly what you were looking for!